Incredibly rare Operations room 'counters' used to display important information relating to an enemy raid. When details of aircraft were received at Group Filter room level it was interpreted on a map table using plotting 'counters' in the form of coloured arrows, discs and shields. 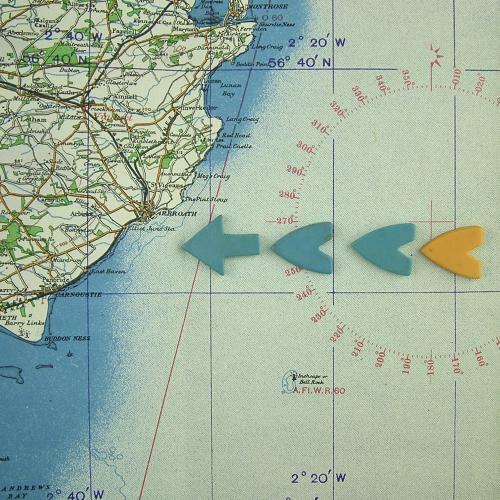 Arrows indicated the direction of aircraft seen over land by Observers or over sea by radiolocation. Shields indicated aircraft heard over land or sea by Observers and discs indicated circling aircraft. The colour of the plotting pieces related directly to those on the Sector clock such that information was updated every 5 minutes. Here we are offering four counters in the form of one blue arrow, two blue and one yellow shields. They are approximately 2.5cm long, made from some form of early plastic and are a little soiled but in very good overall condition. A fantastic opportunity to create a small Battle of Britain Operations room display. If you are lucky enough to own a Sector clock then this is a must have item. NB, map shown for display purposes only. Stock code M23374-1.